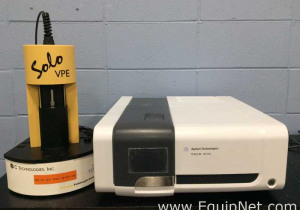 This Waters MicroMass Quattro LC Triple Quadrupole Mass Spectrometer looks to be in good cosmetic condition, showing signs of wear and previous use. Due to some missing internal parts, I am unable to power on this spectrometer. This unit appears to be missing one turbo as seen in the photos. There is a second turbo present inside the unit. Since I cannot formally test this item, it is being sold as-is. Unpacked dims 52x28x22 see pictures for more details. Due to the size and weight of this item, a custom pallet may be required to ship it. The custom pallet shall be paid for by the purchaser. We add hundreds of new listings every week. Be sure not to miss any Waters Micromass Quatt by subscribing to our email updates.